The owners requested a classic shingle-style, Gambrel-roofed house for this waterfront site on the Chesapeake Bay. Bernardon created an open plan that kept the footprint compact while ensuring panoramic water views from every space. The home features stone accents on the exterior, including two stone chimneys and a stone base. A columned porch graces the stained, Craftsman-style front door. A three-car garage was designed as a detached structure to preserve water views on the approach. The second floor of the garage provides extra recreation space and-or bunk space. The first floor has an open plan with stained hardwood floors, white coffered ceilings, and square-paneled columns. The north-facing window wall spans the entire great room and opens the view immediately upon entry. A switchback stair blocks the view of the kitchen from the foyer, and allows south light into both levels via a dormer window above the landing. Almost every room has a view of the water. 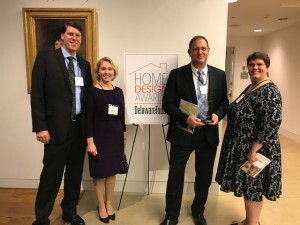 The competition asked local architects, interior designers, landscapers and other industry professionals to enter their best work for consideration by industry experts. The full list of finalists is available at delawaretoday.com. Winners were announced at the Home Design Awards event at the Delaware Art Museum on Tuesday, November 15, 2017.